A San Diego-based pharmaceutical company says it will offer a low-cost alternative to Daraprim, a drug used by cancer and AIDS patients that recently skyrocketed from $13.50 to $750 a pill. 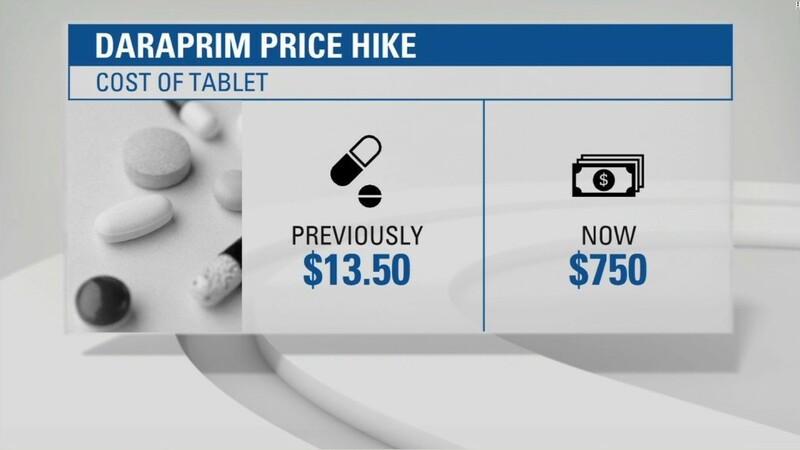 Imprimis Pharmaceuticals says the substitute drug will be priced as low as $99 for a 100-capsule bottle. Daraprim is produced by Turing Pharmaceuticals, which came under intense fire in recent weeks after chief executive Martin Shkreli raised the price of the drug by 5,000%. Imprimis (IMMY) said its substitute drug is a customized formulation that can be used to treat toxoplasmosis, the ailment that AIDS patients previously relied on Daraprim to control. In September, Turing's price increase caught the eye of presidential candidate Hillary Clinton, who tweeted that she wanted to put an end to drug "price gouging." On Monday, Clinton wrote to the Food and Drug Administration and Federal Trade Commission asking that they look at Turing Pharmaceutical's pricing of Daraprim. Clinton also asked the FDA to allow importation of low-price versions of the drug from the U.K. and Canada. "Patients who rely on this treatment should not have their health and lives put at risk because of an unnecessary anti-competitive market, and the FDA should act through all of its available authorities to remedy this situation as soon as feasible," she wrote in the FDA letter, which was first reported by Reuters. - Heather Long, Matt Egan and Chris Isidore contributed to this report.